The Basilica of Saint Stanislaus Kostka is a historic church in Winona, Minnesota, United States, and a prominent fixture on the city’s skyline. Within the diocese it is better known as Saint Stan’s. It was listed on the National Register of Historic Places in 1984 as Church of St. Stanislaus–Catholic and was designated as a Minor Basilica of the Roman Catholic Church on November 10, 2011 by Pope Benedict XVI. When a church is named a basilica, it is given the privilege of having a crest which is a symbolic summary of the important events in the basilica’s history. The Crest of the Basilica of St. Stanislaus Kostka was was designed by Deacon Michael Balfour of Atlanta Georgia. 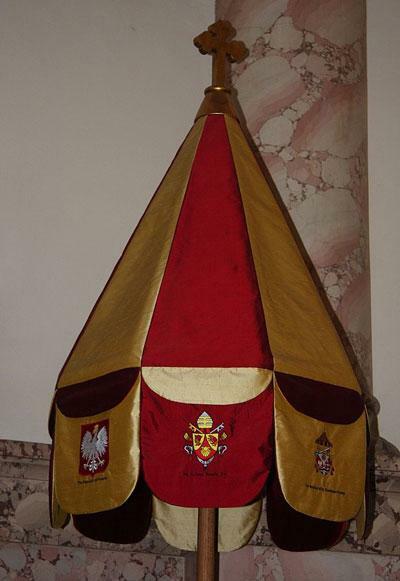 The Umbrella recognizes the relationship between the pope and the basilica. The crossed keys on the top of the crest is the insignia of the Pope. The general design of the crest is that of the chasuble. The lift side has the Eagle of Poland. The seashell is from the crest of Pope Benedict XVI. The right side is the central symbol from the crest of the Diocese of Winona. The red cross in the middle is from the crest of the Archdiocese of St. Paul and Minneapolis. and the blue strip across the lower portion symbolizes the Mississippi River. The crest proudly represents the basilicas’s Polish heritage, its location in Winona and its relationship to the Diocese of Winona and to the pope. The next picture is that of the Papal insignia which is hung outside above the main entrance to the church. 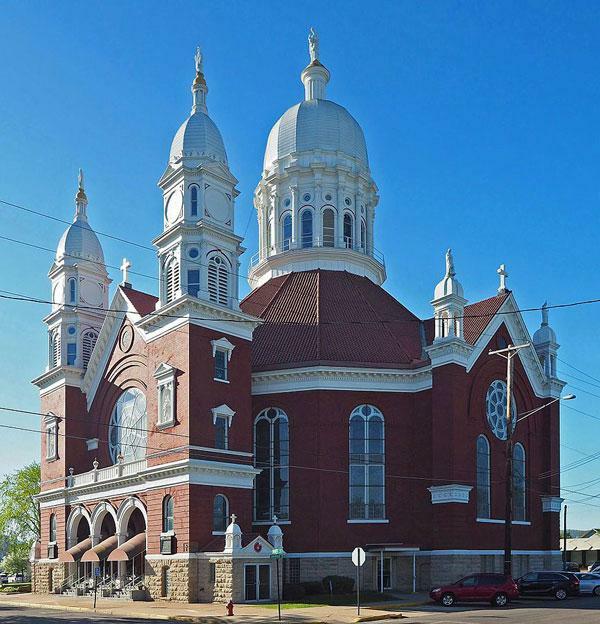 The Basilica of Saint Stanislaus Kostka was designed during the winter of 1893–4 in the Polish Cathedral Style (it has also been attributed to the Romanesque style) by the Winona architectural firm of C.G. 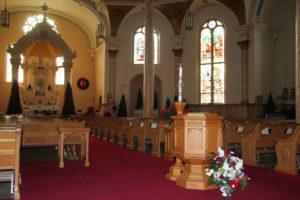 Maybury and Son, which had also designed Sacred Heart-Saint Wenceslaus Church in nearby Pine Creek, Wisconsin. The old church was demolished in the spring of 1894, under the direction of then-pastor Reverend Antoni Klawiter. 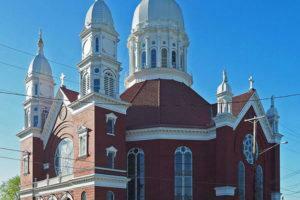 While the new one was built, the parishioners worshiped in the nearby Bohemian parish of Saint John Nepomucene. The foundation stone was laid by the new pastor, Reverend Jakub W.J. Pacholski, on October 28, 1894. The Basilica was dedicated on Thanksgiving Day November 28, 1895, by the Most Reverend Joseph B. Cotter, Bishop of Winona. 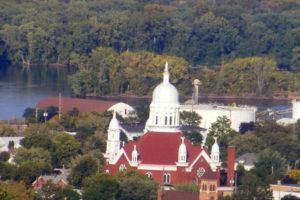 From the very beginning, the Basilica’s great golden dome dominated the skyline of Winona, testifying to the piety and thrift of the Kashubian Polish community which built it at the then-exorbitant cost of $86,000. The Basilica’s interior has undergone many changes over time. It is adorned with beautiful stained glass windows dedicated to various saints and devotions particularly cherished by Kashubian Poles, with inscriptions in Polish. On Thanksgiving Day 1920 the parish celebrated the Basilica’s dedication by consecrating a massive marble altar with a canopy supported by marble pillars. New sanctuary furniture, new confessionals, and a pipe organ were installed by Reverend Pacholski’s successor as pastor, the Reverend Jozef Cieminski (a parishioner in his youth) – along with landscaping of the entire church property. Some of the Basilica’s original furnishings, along with many contemporary furnishings preserved from other churches in the diocese, can be viewed at the nearby Polish Cultural Institute and Museum. To keep the sun and the rain from the pope, a staff person carried an umbrella over him when he walked in the streets of Rome. Here it is displayed on the east side of the church. The eight tabs display symbols of importance in the Parish’s history. They include, the Basilica Crest, the Polish Eagle, the Crest of Pope Benedict XVI, the Crest of Bishop John Quinn, the Crest of the Diocese of Winona, the Crest of the School Sisters of Notre Dame, the Crest of Pope John Paul II, & Princess Wenonah. 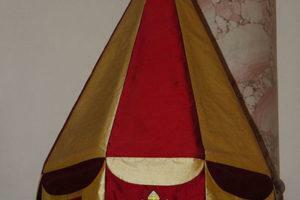 The cover of the umbrelllino was designed by Deacon Michael Balfour of Atlanta and sewn under his direction. In the middle ages, when the pope walked around Rome, a staff person carried a bell on a pole that he rang to create space in the crowds for the procession to continue. Here is on display on the west side of the church. The bell is behind the carving of the church’s facade and is rung at the Mass of Elevation and whenever the pope visits. It was carved by Jorge Posada of Posada Woodcarvings in Atlanta. The Sacrament of Reconciliation (Confession) is offered at the Basilica of St. Stanislaus Kostka at 3 PM on Saturdays. The foundation stone was laid by the new pastor, Reverend Jakub W.J. Pacholski, on October 28, 1894. The Basilica was dedicated on Thanksgiving Day November 28, 1895, by the Most Reverend Joseph B. Cotter, Bishop of Winona. 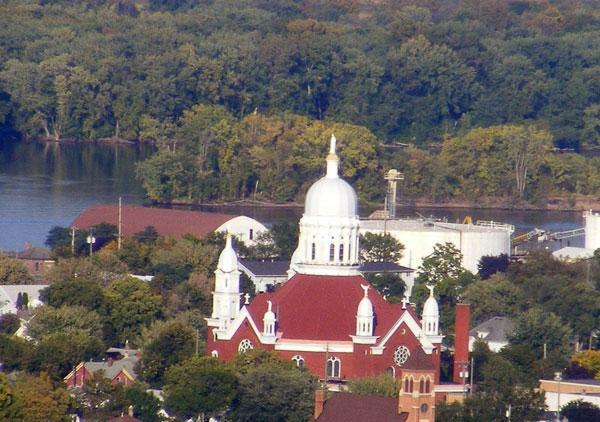 From the very beginning, the Basilica’s great golden dome dominated the skyline of Winona, testifying to the piety and thrift of the Kashubian Polish community which built it at the then-exorbitant cost of $86,000. On Thanksgiving Day 1920 the parish celebrated the Basilica’s dedication by consecrating a massive marble altar with a canopy supported by marble pillars. New sanctuary furniture, new confessionals, and a pipe organ were installed by Reverend Pacholski’s successor as pastor, the Reverend Jozef Cieminski (a parishioner in his youth) – along with landscaping of the entire church property. Some of the Basilica’s original furnishings, along with many contemporary furnishings preserved from other churches in the diocese, can be viewed at the nearby Polish Cultural Institute and Museum.